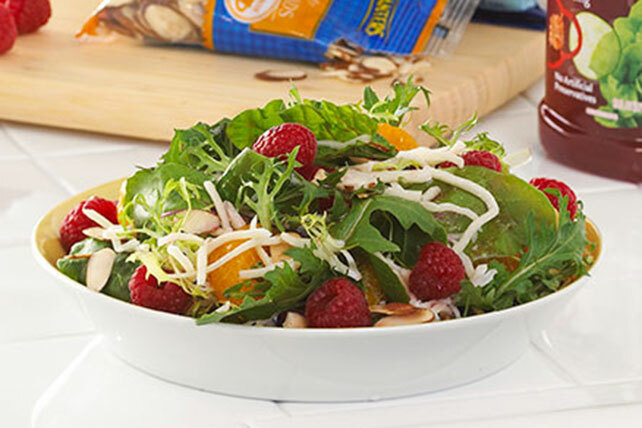 Escape from the ordinary: Mandarin oranges and fresh raspberries add a bright and refreshing twist to salad greens, with sliced almonds providing a fun crunch. Combine all ingredients except dressing in large bowl. Add dressing; toss to coat. Salad can be made ahead of time. Combine all ingredients except dressing. Refrigerate until ready to serve. Toss with dressing just before serving. Toasting nuts adds crunch and intensifies their flavor. To toast nuts in the oven, spread nuts in single layer in shallow pan. Bake at 350°F for 10 to 15 min. or until golden brown, stirring occasionally.